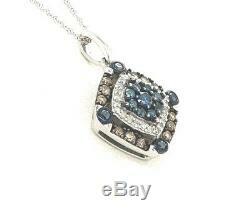 Blue, Brown & White diamond Necklace NWT. Diamond color & clarity: G/H - SI. Metal: 14 karat white gold. Pendant dimension: approx 1/2" Depth: 5.86mm Chain Length: 18". 3 colors of sparkling Diamonds. This is a square pendant hanging from a polished 14 karat white gold bail on the corner to give it some dimension. The center is set with brilliant blue diamonds, then a halo of shimmering white diamonds, followed by brown diamonds. At each corner is set a larger blue diamond. This pendant has a rich look, as the blue & brown diamonds have black rhodium which make this pendant look 3 dimensional. This gorgeous pendant is sure to receive compliments. This pendant is New With Tag. 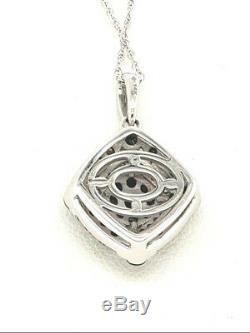 This pendant comes with a beautiful jewelry box. There are many different and unusual items in my store. The item "Genuine Blue White Brown Diamond. 50tcw flower 14k white gold Necklace 18 NWT" is in sale since Friday, October 5, 2018. This item is in the category "Jewelry & Watches\Fine Jewelry\Fine Necklaces & Pendants\Diamond". The seller is "found_treasures1128" and is located in Marietta, Georgia. This item can be shipped to United States, Canada, United Kingdom, Denmark, Romania, Slovakia, Bulgaria, Czech republic, Finland, Hungary, Latvia, Lithuania, Malta, Estonia, Australia, Greece, Portugal, Cyprus, Slovenia, Japan, Sweden, South Korea, Indonesia, Taiwan, South africa, Thailand, Belgium, France, Hong Kong, Ireland, Netherlands, Poland, Spain, Italy, Germany, Austria, Israel, Mexico, New Zealand, Philippines, Singapore, Norway, Saudi arabia, United arab emirates, Qatar, Kuwait, Bahrain, Croatia, Malaysia, Brazil, Chile, Colombia, Costa rica, Antigua and barbuda, Aruba, Belize, Dominica, Grenada, Saint kitts and nevis, Saint lucia, Montserrat, Turks and caicos islands, Barbados, Bangladesh, Bermuda, Brunei darussalam, Bolivia, Ecuador, Egypt, French guiana, Guernsey, Gibraltar, Guadeloupe, Iceland, Jersey, Jordan, Cambodia, Cayman islands, Liechtenstein, Sri lanka, Luxembourg, Monaco, Macao, Martinique, Maldives, Nicaragua, Oman, Peru, Pakistan, Paraguay, Reunion, Bahamas, Switzerland, Uruguay.